WVHS Envirothon team, pictured L to R: Team Advisor Kristin Touw, Jack Pennington, Garret VanGelder, Raina Searle, Claire Curran, Eve Hammerle, Lauren Perillo, Alice Frawley, Brogan Dineen, Jacob Gaydos, Joe McEnry, and Team Advisor Jason Touw. Warwick Valley High School students Jack Pennington, Garret VanGelder, Raina Searle, Claire Curran, Eve Hammerle, Lauren Perillo, Alice Frawley, Brogan Dineen, Jacob Gaydos and Joe McEnry made up the winning team of students from Orange County in this year’s regional Envirothon competition. The team is advised by high school science teachers Kristin Touw and Jason Touw. 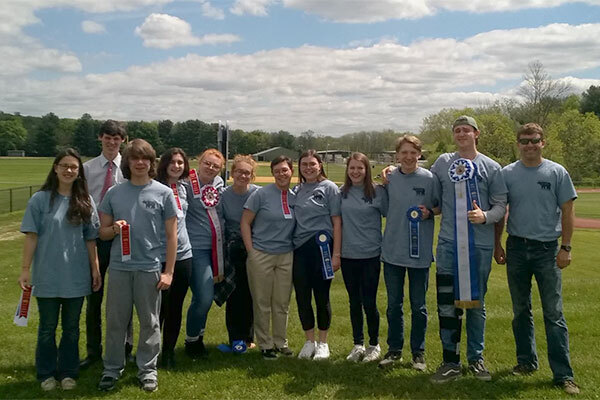 The Hudson Valley Regional Envirothon was held April 26 at the Fresh Air Fund’s Sharpe Reservation in Fishkill. This part of the competition involves schools from 10 counties: Columbia, Delaware, Dutchess, Greene, Orange, Putnam, Rockland, Ulster, Sullivan and Westchester. The highest-scoring school from each county advances to the New York State Envirothon. During the Envirothon, a team of high school students works together to compete on five environmental topics. They are tested on their knowledge of aquatic ecology, soils & land use, forestry, wildlife conservation, and current issues. They also must give a five-minute oral presentation on a problem-solving scenario related to the year’s current topic. In preparation for the event, the students develop research skills, practice team building and gain an appreciation for consensus decision-making. The oral presentation this year focused on The USDA-NRCS (Natural Resources Conservation Service) Conservation Stewardship Plan for Sustainable Dairy Farming. The team spent two days at the state competition in Geneva, NY.